Ok, this little mouse is not ALL dressed up. I mean, she is lacking attire, but she's got it going on in the accessory department. 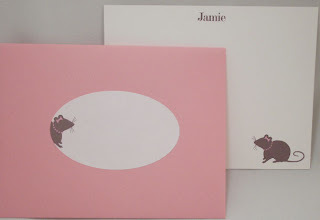 This is the newest stationery set for my etsy shop. 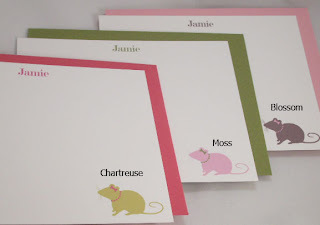 It came about when Jamie at City Chic Country Mouse (click here to see the seriously cute stuff in her shop) wrote that she was having a hard time finding cute mouse graphics. I thought Hmmm... if she was having a challenge, then perhaps other mouse admirers were also. So I set to work and came up with this little gal. who likes to ride on the envelope. This is the three color combinations she comes in. 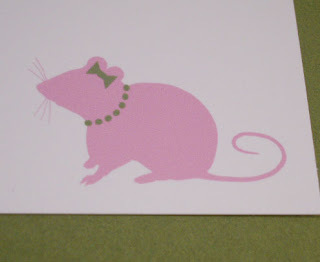 Thank you so much for mentioning us and creating such an adorable mouse!